Give a 6 foot tall birth announcement gift! Our storks are a great way to show your family how excited you are for their new addition! We were so excited to get the call from this sweet boy’s aunt that he was here! We love getting to help families celebrate their new additions! Our 6 foot tall stork signs are a great way to announce the arrival of a new blessing. Sweet Southern Storks is conveniently located in SE Houston and proudly delivers Stork signs for your new baby to Alvin, Clear Lake, Dickinson, Friendswood, Hobby Area, Kemah, League City, Manvel, Pearland, Pasadena, La Porte, Galveston, Seabrook and Texas City. 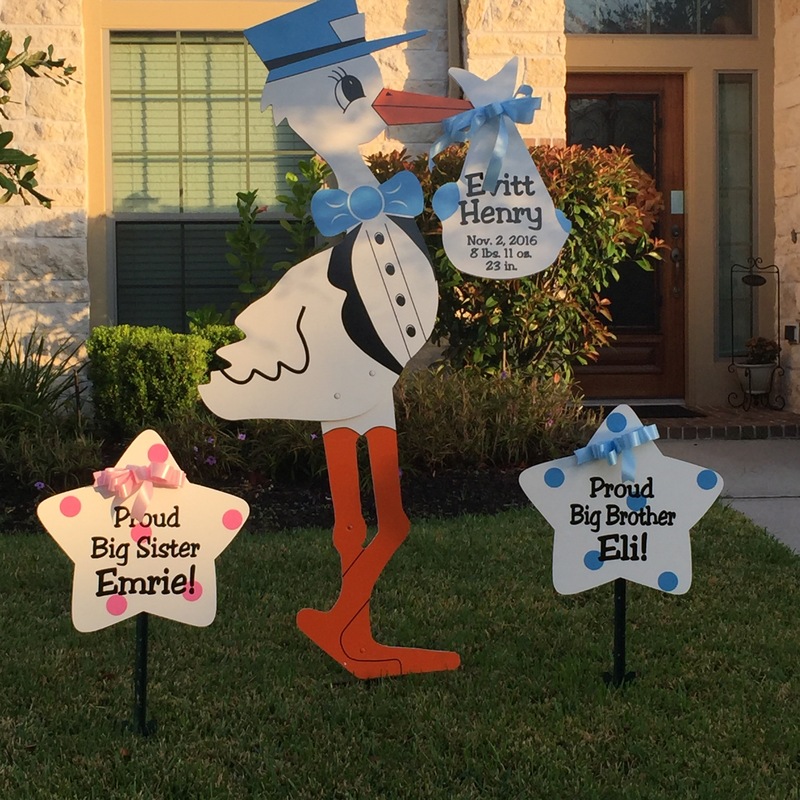 Call us at 832-563-1026 to rent a stork sign to welcome home your new baby or grandbaby. Please visit our FACEBOOK page to see our most current rentals. Sweet Southern Storks, Stork Lady, Houston TX Stork Sign, Houston TX Babies, babies, baby gift, stork sign, stork display, baby lawn stork, lawn sign, baby stork rental, stork rental business, stork sign business, stork rental service, stork delivery, stork yard sign, welcome home baby, sibling signs, big sister sign, big brother sign, birth announcement, baby boy announcement, baby girl announcement, newborn, new baby, dad, mom, new mother, parents, grandparents, grandchildren, lawn greetings, yard greetings, Alvin, TX, Clear Lake, TX, Dickinson, TX, Friendswood, TX, Hobby Area, Kemah, TX, League City, TX, Manvel, TX, Pearland, TX, Pasadena, TX, La Porte, TX, Galveston, TX, Seabrook, TX, Texas City, TX, Webster, TX, Houston, TX.